Because there are so many tools available, it is critical to completely understand virtualization management requirements within the network and within the enterprise. PTS provides a Virtualization Management Consulting Service aimed at helping clients make quality decisions on the deployment of virtualization management tools in terms of needs, training, value, limitations, and ease of use. Centralized virtualization management tools offer several advanced features and ease the management burden for a larger number of servers. Monitoring tools provide a feature rich and flexible virtual infrastructure monitoring capability. Server virtualization security solutions can be so much more efficient for a virtual infrastructure than are traditional tools. 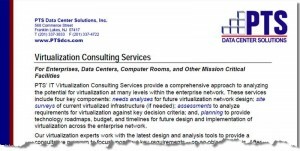 To learn more about recommended virtualization solutions visit PTS’ Computer Room Design to search by manufacturer, product, product category, or solution. Alternatively, to visit our VMware solutions and educational pages visit the PTS partner page for VMware.